Carousels are another fabulous example of the "low arts" that I love to celebrate, as well as one of the most evocative symbols in the popular imagination of the golden age of circuses, boardwalks, fairs, zoos, and classic amusement of any kind. These flamboyantly elaborate structures harken back to the family outings of a bygone prosperous era; a grand yet accessible touchstone for the allure of life's innocent pleasures. Where did these imaginative rides come from? According to the Entertainment Designer, we can thank a game played by Arabian and Turkish horsemen in the 12th century. Italian observers during the crusades dubbed the sport "carosello," which translates to "little war," which apparently was an apt description of the ferocity with which the riders played it. When the French adapted it, it became the "carousel" that we know and love. The first carousels were developed as practice mechanisms for the sport, evidence of which can still be found in the rare carousel ride that incorporates a ring toss. The carousel at the Santa Cruz Beach Boardwalk has a ring toss (rings are thrown into the clown's mouth, which can be seen in the background). The device caught on, and quickly started becoming constructed as a ride for fairs and other attractions. 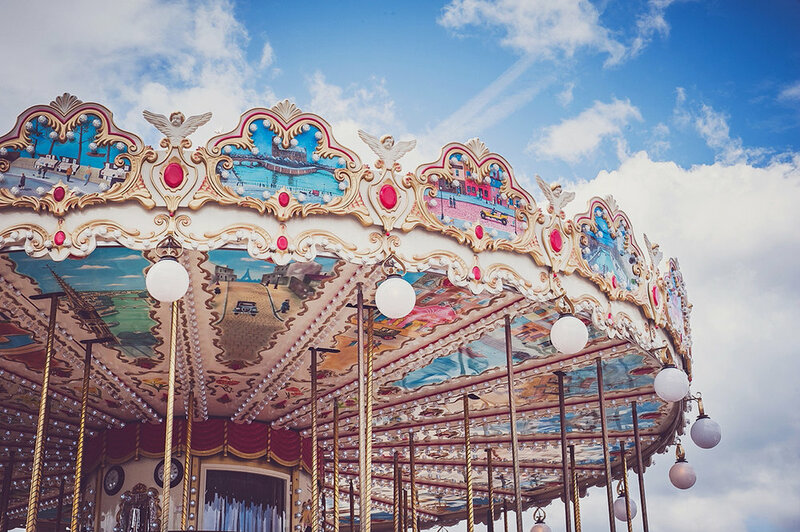 However, these early versions were still powered by either men or horses, and carousels didn't really take off until Englishman Thomas Bradshaw introduced the first steam-powered "roundabout" in 1861. With this new power source, carousels entered their heyday, which spanned The Gilded Age. The trend was only enhanced by its American adopters, who built upon the original idea with larger, more grandiose interpretations. The addition of other creatures besides horses was also an American innovation, adding to the whimsical nature we associate with carousels. 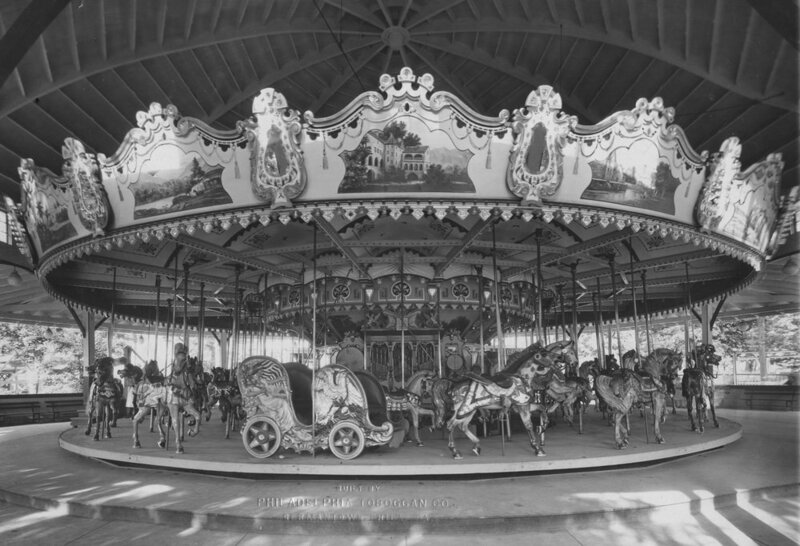 An original wooden carousel crafted by the Philadelphia Toboggan Company. A combination of the economic constraints of the Great Depression and the introduction of the much more exciting roller coaster led to the decline of carousel production and the demotion of the attraction to "children's ride." 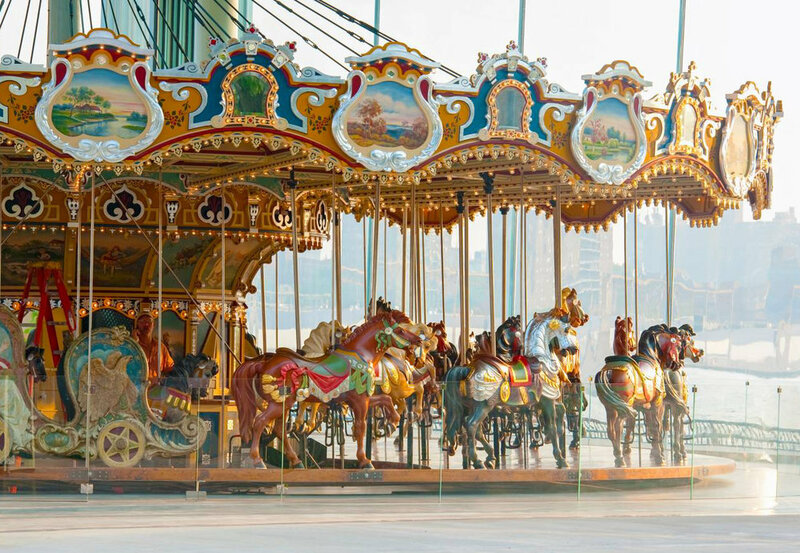 The carousels that were built once the economy came out of its slump lacked the hand-carved craftsmanship of the originals, becoming the cast aluminum and fiberglass structures most of us are familiar with today. Original beauties can still be found in some rare spots, the International Museum of Carousel Art being the premiere collection. Paris, photo by Lauren Kriedeman. Riverside Holiday Park, Southport, Meyerside. The carousel still looms large in our collective nostalgia, and is commonly used as a theme for merchandise, parties, and more. With its conjuration of the joyous celebrations of The Gilded Age, why wouldn't it be?